In a magazine interview which was printed in April of 1975, Ralph Bakshi was asked about the project he was then working on. With the passionate enthusiasm which characterizes him, Bakshi replied, "I'm writing and drawing an incredible fantasy vision of the future." 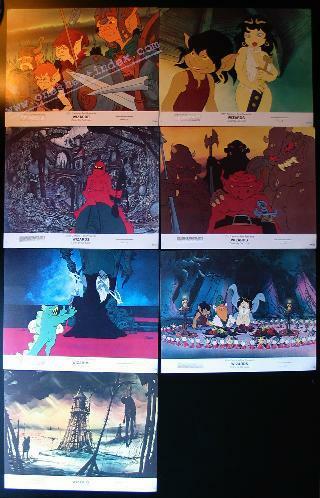 Ralph Bakshi's film, Wizards" has been completed and the 20th Century-Fox release premiered in 1976. For the first time, Bakshi takes a look at an era and place far beyond the modern world he has depicted so humorously and controversially in films like "Fritz, the Cat" and "Heavy Tratfic." Wizards is an animated adventure epic unparalleled by any- thing that has yet appeared on the screen. To create a fantastic world which an audience can substitute for the world of reality, Bakshi has created the most detailed drawings ever assembled for a feature-length animated film. The result is a visual richness totally different in feel from the sleek contemporary feel of Bakshi's examinations of ghetto street life. "I have developed a technique for "Wizards'," says Bakshi, "which allows entire armies to march across the scene in perfect motion during the film's major battle sequences. It has made possible, in animation, to have the same visual sweep that coined the word spectacular with regard to films."